Gold and silver futures traded in very narrow ranges Thursday with both logging modest settlement changes for a third straight session. Gold for December delivery dipped $1.10, or 0.09%, to settle at $1,219.90 an ounce on the Comex division of the New York Mercantile Exchange. "Right now, gold is in a holding pattern until you get a little bit more of data," Reuters quoted Josh Graves, senior commodities strategist at RJO Futures. 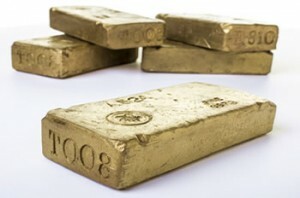 Gold futures ranged from a low of $1,218.40 to a high of $1,225.60. They added 0.2% on Wednesday, climbed less than 0.1% on Tuesday, and lost 0.5% on Monday — ending at their worst level since July 13, 2017. Ending higher for a third straight day, silver for September settled up 3 cents, or 0.2%, to $15.462 an ounce. Silver futures traded between $15.38 and $15.53. They gained 0.4% on Wednesday, rose 0.2% on Tuesday, and dropped 0.7% on Monday — closing at their lowest point since April 7, 2016. October platinum advanced $4.60, or 0.6%, to $834.10 an ounce, ranging from $827.50 to $842.30. Palladium for September delivery tacked on $12, or 1.4%, to $898.40 an ounce, trading between $885.30 and $901. Gold rose $4.80, or 0.4%, to 1,214.35 an ounce. Silver added 13.5 cents, or 0.9%, to $15.48 an ounce. United States Mint bullion sales grew by 5,000 ounces in $50 American Gold Eagles. Below is a sales breakdown of U.S. Mint bullion products with columns listing the number of coins sold during varying periods.